Phooey To The Calendar, It’s Spring! We have had some sunshine every once in a while, sometimes for the whole day. Plus the temperatures have been mild, up into the 50’s a lot. I noticed the first flowers started blooming around the first of March – they decided to start blooming even though the official start of Spring isn’t until March 20th. I have seen camellias, rhodos, even an azalea yesterday all in bloom. The cherry trees with lacy flowers and even some of the puffy cherry trees are blooming. 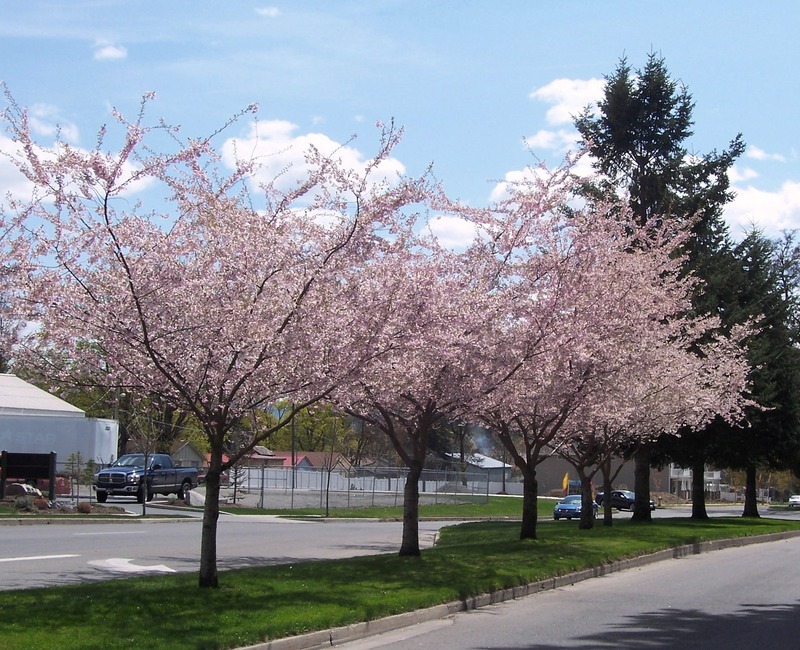 I was going home from visiting Mom on Friday and a whole line of cherry trees were starting to bloom. The daffodils are starting to bloom in the yard and also next door. I think it depends on how protected from the cold wind plants are as to how far along they are. The forsythia is usually the first to come out, they are now slowly emerging. I enjoy Spring as each plant begins to grow leaves and then blossom while others put out blossoms first, then leaves. I am wondering how many bulbs are left after the big clean up. I remember a quote somewhere that really makes my heart glow – The Earth laughs in flowers. Oh dear, Eddie can’t find Bunny now that he has made the bed, I need to find her. How she wandered into the office I don’t know, the last time I saw her was on my pillow. I have been sleeping with her a lot, so very comforting and sweet. I think her name is actually Sweet Pea since I find myself calling her that without realizing it. all is well now. Mom’s is in blue and blue feathered hat – you get the idea. I went to see Mom on Friday, she had had a visitor the day before – it was Luzma bearing gifts. 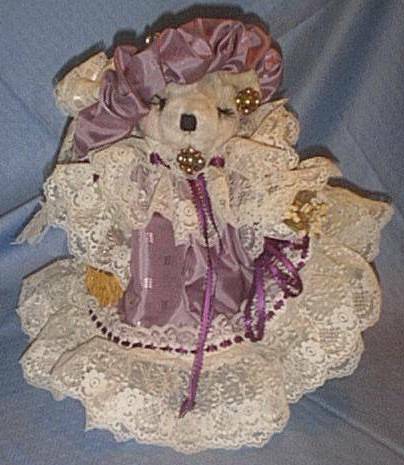 She brought her a beautiful bear dressed in a lovely gown and a hat with feathers. It is on Mom’s dresser. She also brought flowers – little dark pink roses – small box of chocolates and a packet of cookies. Apparently she spent quite a lot of time with her, though Mom doesn’t remember it. I have to remind myself not ask about things that happened before the present moment, her short-term memory is gone. Then she thinks she missed out on something. My two packets of cookies were anticlimactic, I found some sugar-free chocolate chunk for Jan and also brought sugar cookies with green frosting and shaped sprinkles on top for St. Patrick’s day. They all enjoyed them and I was glad. I’m learning not to bring something for the house all the time or they will expect it, once a month is better. This came from Kathy who is more knowledgeable than I am. I appreciate her advice and am so glad she came with me to find a home for Mom. The two new residents are Everett, he is about 86 and in a wheelchair. He doesn’t seem to be chatty, maybe when I know him better – he certainly scarfed up the cookies in a hurry. Mom gave him hers, so I gave her another one and said it is for her to eat, not give away. I don’t remember the woman’s name, she too is in a wheelchair and is about to turn 102 – looks as though Mom isn’t the oldest any more. Mom still asks about her mother, her grandmother, even Aunt Clara. I just tell her they are watching over her and preparing a place for her on the other side. Also that when the time comes, there will be guides to help her through the transition, she won’t have to do it herself. Sometimes she says she is glad I told her that. This time she said she feels safe when she is sitting with Jan, but when she is alone she is scared. I asked her what scares her and she is scared what to do if something happens. I tried to reassure her that everyone in the house is there for her and I am only a phone call away. She doesn’t think she knows how to use the phone, so I said just ask some in the house – I will be there in 20 minutes. I hope that reassured her, even for 5 minutes. That’s a first. Thursday was a fun day, I had my massage in the morning with Debye and then went to lunch with Kathie Brodie at Queen Mary Tea Room. We haven’t seen each other for quite a while, she is starting a new business and I have already written many words about I have been doing. We have so much in common and it turns out it is a two-way street for us – I learn so much from her and she learns a lot from me. She was talking about finally understanding one of her life lessons, though still hasn’t quite learned because it keeps coming in different ways so she doesn’t see it coming. Light bulb moment for me! How amazing that over the years we have both been learning a lot of the same things – talking to her helps put into words what I am thinking and feeling. We had a lovely lunch and of course a pot of tea. We both tried different ones, though I love their Creamy Earl Grey. They gave us a taste of Queen’s Afternoon Tea – I loved it! Kathie is a big tea drinker and enjoys trying new one. there is a tea shop in Edmonds she goes to try different teas. I had an email from her yesterday – she enjoyed the outing with me but forgot it was caffeine and she finally figured out why she couldn’t get to sleep the night before. It’s been a delightful week. This entry was posted on March 17, 2013 at 11:51 am and is filed under Musings. You can follow any responses to this entry through the RSS 2.0 feed. You can leave a response, or trackback from your own site.